A performing arts organization was preparing for an annual appeal and wanted to suppress any deceased individuals on their file prior to mailing. With TrueDeceased they were able to identify deceased records on their file, view important address hygiene details and improve outreach, all for our flat rate of $50 including 6 months of free updates. The organization processed their file for free and within minutes received our complimentary TrueDeceased report indicating they had more than 20 deceased records on a file of approximately 6,000. In addition, it identified almost 200 non-deliverable records on the file indicating that it should also be processed with TrueNCOA. As with TrueDeceased, the organization was able to process their file for free and view our complimentary TrueNCOA report indicating an estimated postage savings of $300. The results were immediately available for export for our flat rate of $20 including 95 days of free updates. Our quick, inexpensive deceased suppression processing not only identified potential savings and mailing costs, but more importantly allowed the organization to treat the families of the deceased patrons respectfully. Eliminate embarrassing communication with your patrons and donors by suppressing deceased households. An example of this is when a donor has passed and you want to give family members time to bereave their lost one. 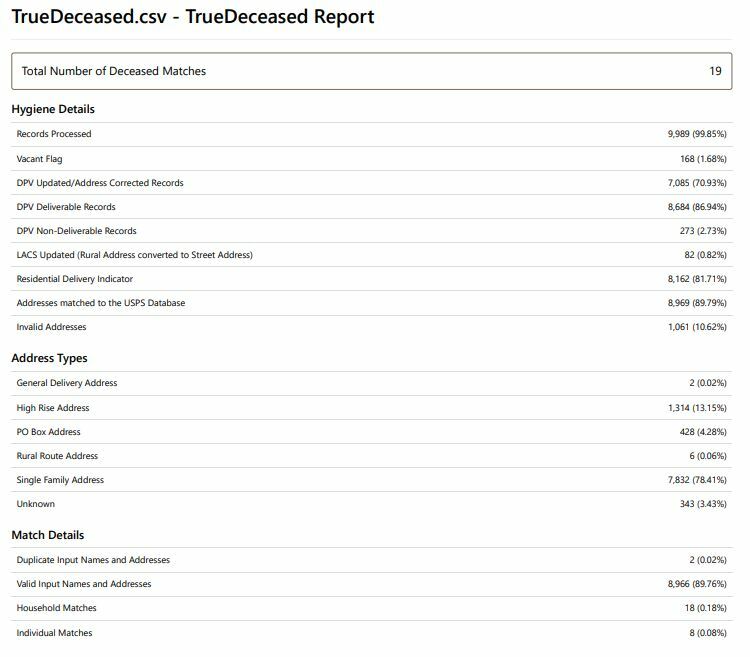 TrueDeceased allows you to determine if there are recently deceased members of a household on your file before you perform any outreach. Process your file for free and review a complimentary report with no obligation to purchase.